News – Page 4 – DEWright Inc.
Commercial crude oil inventories in Cushing, Oklahoma (located in Petroleum Administration for Defense District, or PADD, 2) and the Gulf Coast (PADD 3) totaled a record high 309.4 million barrels as of the week ending November 27 (Figure 1). Based on the recently released storage capacity and line fill data in the September Petroleum Supply Monthly (PSM), EIA estimates 70.2% utilization of working crude oil storage capacity in Cushing, Oklahoma and PADD 3 on a combined basis. This utilization level is only slightly below the record set in the week ending April 24 of this year. While often assessed separately, looking at the combined utilization of storage capacity in Cushing and PADD 3 is currently relevant, given the increased pipeline capacity to move crude oil from Cushing to the Gulf Coast—reflected in the recently low Brent-WTI spread—during a time of high global crude oil inventory builds. Despite relatively high crude oil inventories and crude oil storage capacity utilization, there is still more than 100 million barrels of capacity available within the two areas. 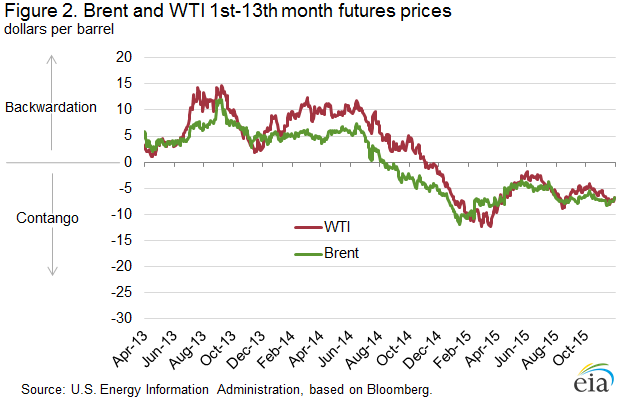 For much of 2013-14, both WTI and Brent were in backwardation, meaning that near-term prices were higher than those for longer-term delivery (Figure 2). However, the backwardation in WTI prices was more pronounced and variable than for Brent prices. This difference reflected steady crude inventory declines at Cushing as a result of increasing pipeline takeaway capacity to bring crude from Cushing storage to refineries on the Gulf Coast for processing. 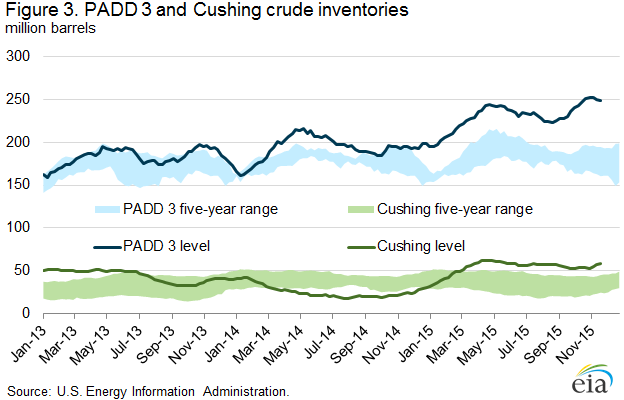 From mid-2013 through mid-2014, Cushing inventories mostly declined and PADD 3 inventories were regularly above the historical five-year average, as crude oil movements from PADD 2 to PADD 3 increased sharply (Figure 3). In mid-2014, as a result of global crude supply outpacing demand, the Brent price moved to contango, with current month prices lower than the thirteenth month forward price. A similar dynamic with WTI prices was slower to emerge because PADD 3 inventories were falling, and Cushing levels were very low, putting upward pressure on near-month WTI prices. WTI prices did not enter contango until the fourth quarter of 2014, following a sharp drop-off in both Brent and WTI prices. As WTI entered contango late in 2014, Cushing inventories began to increase again, and have been above the five-year range since early March. However, trade press reports that ample takeaway capacity now exists to move crude oil from Cushing to the Gulf Coast. The recent build in Cushing inventories reflects the WTI contango, and not a lack of infrastructure. Since September, the monthly average Brent-WTI spread has been about $2 per barrel. EIA has published net available shell and working crude oil storage capacity data with the March and September PSM releases since September 2010. However, until recently, calculating an effective utilization rate for this capacity was difficult. Simply dividing EIA’s total commercial inventories by working capacity overestimated utilization because the inventory data include crude oil not stored in tanks, such as that held in pipelines (pipeline fill). As of the March 2015 release, EIA now publishes more granular data indicating estimated pipeline fill, improving the utilization calculation. Total working capacity is often the best measure of total available storage since it excludes tank bottoms and contingency space. Crude oil working storage capacity in Cushing and PADD 3 increased by a total of 6.6 million barrels (1.8%) between March 31 and September 30 of this year. At just over 70%, total utilization remains relatively high compared with utilization rates during 2011 through 2014, which were mostly below 60% for Cushing, Oklahoma and PADD 3. Since March 2011 working crude oil storage capacity in the United States has increased by 95.6 million barrels. Most of the increase in capacity was in Cushing, Oklahoma and PADD 3, with build-outs of 25.0 million barrels and 55.7 million barrels, respectively. 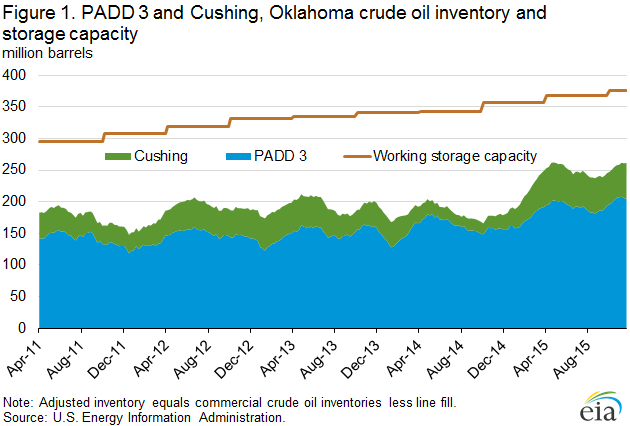 Combined Cushing, Oklahoma and PADD 3 accounted for about 84.5% of the increase in storage capacity since March 2011. The U.S. average retail regular gasoline price fell four cents from the prior week to $2.06 per gallon on November 30, 2015, down 72 cents from the same time last year. The Midwest price decreased six cents to $1.88 per gallon, while the Rocky Mountain price declined four cents to $2.05 per gallon. The Gulf Coast and West Coast prices were both down three cents, to $1.82 per gallon and $2.55 per gallon, respectively. The East Coast price decreased two cents to $2.09 per gallon. The U.S. average diesel fuel price decreased two cents from the previous week to $2.42 per gallon, down $1.18 from the same time last year. The West Coast, Midwest, and Gulf Coast prices were each down three cents, to $2.62 per gallon, $2.41 per gallon, and $2.25 per gallon, respectively. The Rocky Mountain price declined two cents to $2.45 per gallon, and the East Coast price decreased one cent to $2.46 per gallon. U.S. propane stocks decreased by 2.1 million barrels last week to 104.1 million barrels as of November 27, 2015, 24.7 million barrels (31.1%) higher than a year ago. Gulf Coast inventories decreased by 1.6 million barrels and Rocky Mountain/West Coast inventories decreased by 0.3 million barrels. Midwest inventories fell by 0.2 million barrels, and East Coast inventories decreased by 0.1 million barrels. Propylene non-fuel-use inventories represented 3.0% of total propane inventories. As of November 30, 2015, residential heating oil prices averaged $2.36 per gallon, nearly 2 cents per gallon below last week and almost 97 cents lower than one year ago. The average wholesale heating oil price this week was just shy of $1.43 per gallon, 1 cent higher than last week and $1.07 per gallon lower than a year ago. Residential propane prices averaged just under $1.96 per gallon, almost 1 cent per gallon higher than last week’s price and 45 cents lower than one year ago. Wholesale propane prices averaged slightly over 50 cents per gallon, more than 1 cent per gallon higher than last week and 43 cents lower than last year’s price for the same week. EIA has issued a report on expected fourth-quarter refinery outages and their potential implications for the availability of gasoline and distillate supply at the Petroleum Administration for Defense District (PADD) and sub-PADD levels. This report analyzes the availability of refinery capacity to produce diesel fuel and heating oil (distillate) and gasoline, focusing on two refinery units, the atmospheric crude distillation unit (ACDU) and the fluid catalytic cracking unit (FCCU), which are strongly correlated with distillate and gasoline production, respectively. In addition, data for planned maintenance on catalytic reforming units (CRU) and hydrocracking units (HU) are provided. The report also contains a discussion of current market conditions and average historical unplanned outages. Refinery outages result from the planned shutdown of refinery units for maintenance and upgrades, and from unplanned shutdowns from a variety of causes such as mechanical failure, bad weather, power failures, fire, and flooding. Planned maintenance is typically scheduled when refined petroleum product consumption is relatively low. Across the different regions of the country, fourth-quarter 2015 planned refinery maintenance is concentrated in October, and many refineries have returned to or are in the process of returning to normal operations. Less maintenance is planned for November and minimal maintenance is planned for December. 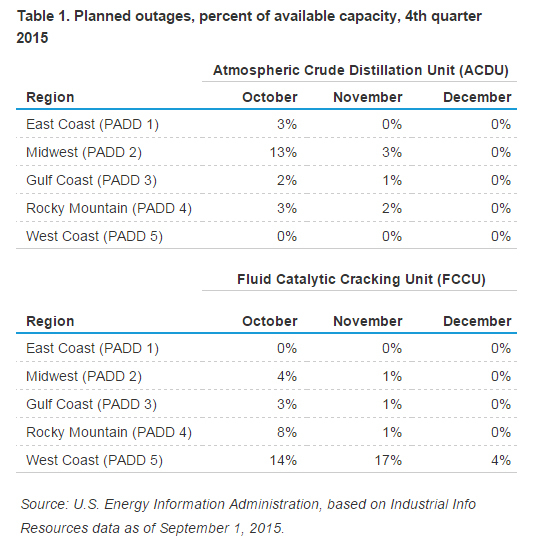 Table 1 provides a by-PADD, by-month summary of the percentage of available refining capacity expected to be out of service for maintenance during October through December. Source: U.S. Energy Information Administration, based on Industrial Info Resources data as of September 1, 2015. In most regions, fourth-quarter planned maintenance is light compared to last year as well as to historical levels. However, in the Midwest, 13% of ACDU capacity is expected to be offline for maintenance in October. After generally staying above the five-year range for much of 2015, PADD 2 ACDU gross inputs fell off sharply in early October. For the week ending October 9, the rolling four-week average for PADD 2 gross inputs was 209,000 barrels per day (b/d) lower than the five-year average. Despite the decrease in gross inputs, distillate inventories remain above the five-year average for this time of year and gasoline inventories are similar to where they were last year. While Midwest refineries supply most of the distillate fuel and gasoline that is consumed in the region, the Midwest also receives products from the Gulf Coast, including supplemental supply during disruptions. PADD 5 (West Coast) planned ACDU maintenance is minimal over the period, but planned FCCU maintenance in October and November is more than 50,000 b/d higher than the 10-year average and more than 25,000 b/d higher than the 10-year maximum. The ongoing unplanned FCCU outage following the February 18 explosion at the ExxonMobil refinery in Torrance, California, has continued to put upward pressure on gasoline prices in the region. Imports of total motor gasoline to California ranged between 28,000 b/d and 68,000 b/d in March through July, compared with an average of 5,000 b/d in 2013-14. Further outages, either planned or unplanned, would exacerbate the supply situation. PADD 5 gasoline inventories declined steadily during the summer driving season, reaching a multiyear low of 25.7 million barrels on August 21. Since then, gasoline inventories have rebuilt and have been above the five-year average since September 11. Distillate inventories have been above the five-year average for much of the year. The U.S. average retail price for regular gasoline declined six cents from last week to $2.28 per gallon on October 19, down 84 cents per gallon from the same time last year. The Midwest price fell 11 cents to $2.30 per gallon, followed by the Rocky Mountain price, which was down seven cents to $2.36 per gallon. The West Coast and Gulf Coast prices each fell five cents, to $2.70 per gallon and $2.00 per gallon, respectively. The East Coast price decreased three cents to $2.17 per gallon. The U.S. average diesel fuel price decreased three cents from the previous week to $2.53 per gallon, down $1.13 per gallon from the same point last year. The Rocky Mountain price posted the lone price increase, up less than one cent to remain $2.52 per gallon. The Midwest, East Coast, and West Coast prices each decreased three cents, to $2.60 per gallon, $2.52 per gallon, and $2.70 per gallon, respectively. The Gulf Coast price was down one cent to $2.33 per gallon. U.S. propane stocks decreased by 0.6 million barrels last week to 101.6 million barrels as of October 16, 2015, 20.0 million barrels (24.5%) higher than a year ago. Gulf Coast inventories decreased by 0.5 million barrels and Midwest inventories decreased by 0.3 million barrels. Rocky Mountain/West Coast inventories increased by 0.1 million barrels while East Coast inventories remained unchanged. Propylene non-fuel-use inventories represented 4.4% of total propane inventories. As of October 19, 2015, residential heating oil prices averaged nearly $2.43 per gallon, 1 cent per gallon lower than last week and $1.05 lower than one year ago. The average wholesale heating oil price this week is $1.60 per gallon, 10 cents less than last week and $1.05 per gallon less than a year ago during the same week of the 2014-2015 heating season. Residential propane prices averaged $1.90 per gallon, less than 1 cent per gallon higher than last week’s price and 49 cents lower than one year ago. Wholesale propane prices averaged 54 cents per gallon, 4 cents per gallon lower than last week’s price and 53 cents lower than the price on October 20, 2014. Unplanned refinery outages can have noticeable effects on liquid fuel markets, disrupting supplies of gasoline and distillate. In late August, unplanned outages occurred at two refineries on the East Coast, Petroleum Administration for Defense District (PADD) 1, affecting a significant portion of PADD 1 gasoline production capacity. However, unlike similar incidents on the West Coast (PADD 5) and in the Midwest (PADD 2), there was no significant movement in gasoline prices as a result of the outages. How a region is supplied, what alternative supply options exist, and the costs and lead times for those options will largely determine to what extent prices react to unplanned outages (Figure 1). While refineries make arrangements for alternative sources of supply during periods of planned maintenance to ensure that obligations are met, it sometimes takes days or weeks for markets to adjust to the sudden loss of production when an unexpected outage occurs. As a result, unplanned refinery outages often result in a reduction in supply that causes prices to increase, sometimes dramatically. The severity and duration of these price spikes depend on how quickly the refinery problem can be resolved and how soon supply from alternative sources can reach the affected market. All five PADDs have two immediate sources of alternative supply: inventories and production from other in-region refineries. However, should these sources prove insufficient, the next option for alternative supplies is somewhat different for each region (Figure 2). The West Coast is isolated from other U.S. markets and located far from international sources of supply, so the region is dependent on in-region production to meet demand. Mainland PADD 5 has three distinct supply/demand centers (Pacific Northwest, Northern California, and Southern California), separated from each other by a lack of north-south pipelines within the PADD and from other U.S. markets by mountains to the east. In the event of a major unplanned refinery outage — such as the one that occurred atExxonMobil’s refinery in Torrance, California in February — inventories and production from unaffected refineries in the immediate area are insufficient to meet demand. Limited pipeline connectivity between market centers and neighboring regions, as well as the more stringent product specifications for California, mean that the only remaining alternative resupply option for PADD 5 is imports. Since the Torrance outage, imported supplies of gasoline have been arriving in Southern California from all over the world at an average rate of 27,000 — 68,000 barrels per day (b/d) for March through July (latest state-specific data available). This compares with an average of 5,000 b/d in 2013-14. Total motor gasoline imports into PADD 5 as a whole were 79,000 b/d for the week ending October 9. The distance required for these imports requires long lead time and higher prices. The Rocky Mountain (PADD 4) region is another relatively isolated regional market, but one that still has access via pipelines to refineries in the Gulf Coast and the southern half of PADD 2. Additionally, demand in the Rocky Mountains is small compared to other U.S. markets. Together, these factors allow the Rocky Mountain region to rely on in-region refinery production and receipts from other regions in the event of an unplanned outage. The Midwest is a large region consisting of multiple semiconnected markets, but without access to international markets via marine movements. PADD 2 refineries produce significant amounts of gasoline and the region has increasingly become dependent on in-region production, but the region still requires additional supplies from the Gulf Coast (PADD 3) to meet demand. In the event of a major unplanned outage, such as the August partial shutdown of the BP refinery in Whiting, Indiana, alternative supply comes from the Gulf Coast via several large product pipeline systems. Although this resupply option requires less time than acquiring supplies from the international market, it does require higher prices in the affected market versus the Gulf Coast to attract supplies, as happened in the summer of 2013 and in early August of this year. The Gulf Coast is home to half of U.S. refining capacity and produces far more gasoline and distillate than the region consumes. 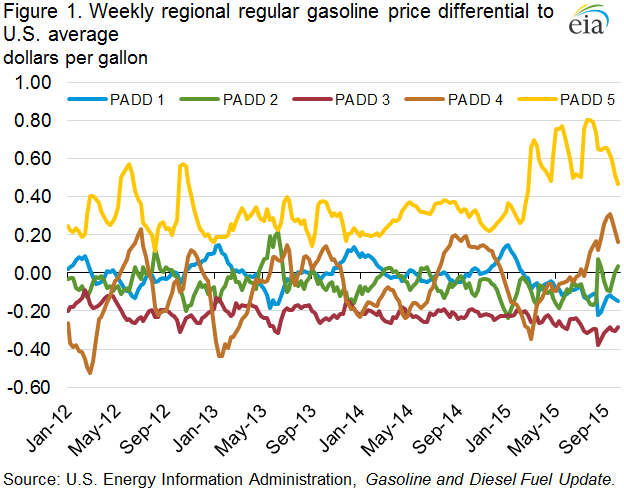 Therefore, unplanned refinery outages in PADD 3 rarely have a large effect on wholesale and retail prices. Gasoline demand on the East Coast far exceeds in-region refinery production. Additional supplies from the Gulf Coast arrive via pipeline and ship, but given existing infrastructure and regulations, are not entirely sufficient to meet demand. 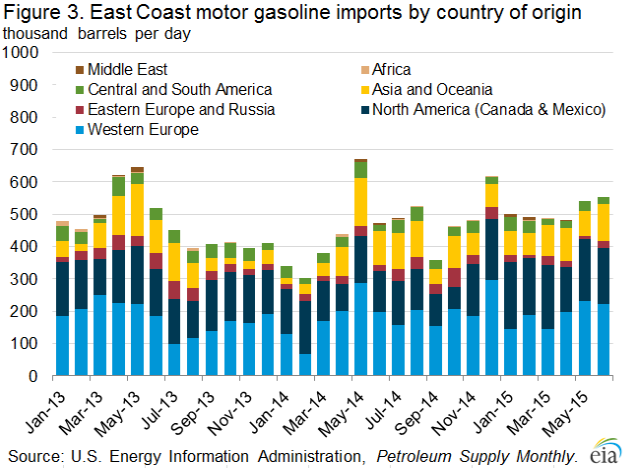 Therefore, the East Coast also imports gasoline, mostly from relatively close-by refineries in Europe and eastern Canada (Figure 2). In the event of major unplanned refinery outages — like those that occurred at PBF’s refinery in Delaware City, Delaware and the Phillips 66 refinery in Bayway, New Jersey, in late August — the East Coast’s alternative supply option is imports. Because gasoline cargoes are actively traded in the Atlantic Basin, and the distances involved are not as great as on the West Coast, East Coast prices tend to rise more modestly following refinery outages compared with those on the West Coast. EIA will soon release its Refinery Outages: Fourth-Quarter 2015 report, with data on planned refinery maintenance for the remainder of this year. The U.S. average regular gasoline retail price increased two cents from the previous week to $2.34 per gallon on October 12, 2015, 87 cents per gallon lower than at the same time last year. The Rocky Mountain and West Coast prices both decreased, by five cents and four cents respectively, to $2.42 per gallon and $2.75 per gallon, respectively. The Midwest price increased five cents to $2.41 per gallon. The East Coast and Gulf Coast prices both increased two cents, to $2.19 per gallon and $2.05 per gallon, respectively. The U.S. average diesel fuel price increased six cents from last week to $2.56 per gallon, down $1.14 per gallon from the same time last year. The Midwest price increased 15 cents to $2.63 per gallon, supported by widespread refinery maintenance and harvest demand. The West Coast price increased four cents to $2.73 per gallon, while the East Coast price was up three cents to $2.55 per gallon. The Gulf Coast and Rocky Mountain prices each increased two cents, to $2.34 per gallon and $2.52 per gallon, respectively. U.S. propane stocks increased by 1.8 million barrels last week to 102.2 million barrels as of October 9, 2015, 20.8 million barrels (25.5%) higher than a year ago. Midwest inventories increased by 0.7 million barrels while Gulf Coast and East Coast inventories both increased by 0.6 million barrels. Rocky Mountain/West Coast inventories decreased by 0.1 million barrels. Propylene non-fuel-use inventories represented 4.3% of total propane inventories. As of October 12, 2015, residential heating oil prices averaged $2.44 per gallon, 2 cents per gallon higher than last week and $1.08 lower than one year ago. The average wholesale heating oil price this week is $1.70 per gallon, nearly 7 cents more than last week and 97 cents per gallon less than a year ago during the same week of the 2014-2015 heating season. Residential propane prices averaged $1.91 per gallon, nearly 7 cents per gallon lower than last week’s price and 46 cents lower than one year ago. Wholesale propane prices averaged nearly 59 cents per gallon, almost 3 cents per gallon higher than last week’s price and 53 cents lower than the price on October 13, 2014. U.S. crude oil refinery inputs averaged about 15.3 million barrels per day during the week ending October 9, 2015, 292,000 barrels per day less than the previous week’s average. Refineries operated at 86.0% of their operable capacity last week. Gasoline production increased last week, averaging over 9.6 million barrels per day. Distillate fuel production decreased last week, averaging over 4.6 million barrels per day. U.S. crude oil imports averaged over 7.3 million barrels per day last week, up by 247,000 barrels per day from the previous week. Over the last four weeks, crude oil imports averaged 7.3 million barrels per day, 1.7% below the same four-week period last year. Total motor gasoline imports (including both finished gasoline and gasoline blending components) last week averaged 719,000 barrels per day. Distillate fuel imports averaged 130,000 barrels per day last week. U.S. commercial crude oil inventories (excluding those in the Strategic Petroleum Reserve) increased by 7.6 million barrels from the previous week. At 468.6 million barrels, U.S. crude oil inventories remain near levels not seen for this time of year in at least the last 80 years. Total motor gasoline inventories decreased by 2.6 million barrels last week, but are above the upper limit of the average range. Finished gasoline inventories increased while blending components inventories decreased last week. Distillate fuel inventories decreased by 1.5 million barrels last week but are in the middle of the average range for this time of year. Propane/propylene inventories rose 1.8 million barrels last week and are well above the upper limit of the average range. Total commercial petroleum inventories increased by 3.3 million barrels last week. Total products supplied over the last four-week period averaged over 19.5 million barrels per day, up by 1.2% from the same period last year. Over the last four weeks, motor gasoline product supplied averaged 9.1 million barrels per day, up by 3.4% from the same period last year. Distillate fuel product supplied averaged 4.0 million barrels per day over the last four weeks, up by 5.4% from the same period last year. Jet fuel product supplied is up 5.5% compared to the same four-week period last year. U.S. crude oil refinery inputs averaged 16.2 million barrels per day during the week ending September 18, 2015, 310,000 barrels per day less than the previous week’s average. Refineries operated at 90.9% of their operable capacity last week. Gasoline production increased last week, averaging over 9.5 million barrels per day. Distillate fuel production increased slightly last week, averaging 5.1 million barrels per day. U.S. crude oil imports averaged 7.2 million barrels per day last week, down by 13,000 barrels per day from the previous week. Over the last four weeks, crude oil imports averaged over 7.4 million barrels per day, 2.0% below the same four-week period last year. Total motor gasoline imports (including both finished gasoline and gasoline blending components) last week averaged 504,000 barrels per day. Distillate fuel imports averaged 164,000 barrels per day last week. U.S. commercial crude oil inventories (excluding those in the Strategic Petroleum Reserve) decreased by 1.9 million barrels from the previous week. At 454.0 million barrels, U.S. crude oil inventories remain near levels not seen for this time of year in at least the last 80 years. Total motor gasoline inventories increased by 1.4 million barrels last week, and are in the upper half of the average range. Finished gasoline inventories stayed same while blending components inventories increased last week. Distillate fuel inventories decreased by 2.1 million barrels last week but are in the middle of the average range for this time of year. Propane/propylene inventories fell 0.6 million barrels last week but are well above the upper limit of the average range. Total commercial petroleum inventories decreased by 2.9 million barrels last week. Total products supplied over the last four-week period averaged 19.7 million barrels per day, up by 1.6% from the same period last year. Over the last four weeks, motor gasoline product supplied averaged about 9.2 million barrels per day, up by 3.0% from the same period last year. Distillate fuel product supplied averaged 3.8 million barrels per day over the last four weeks, up by 1.3% from the same period last year. Jet fuel product supplied is up 5.7% compared to the same four-week period last year. U.S. crude oil refinery inputs averaged over 16.1 million barrels per day during the week ending September 4, 2015, 279,000 barrels per day less than the previous week’s average. Refineries operated at 90.9% of their operable capacity last week. Gasoline production decreased last week, averaging 9.6 million barrels per day. Distillate fuel production decreased last week, averaging 4.8 million barrels per day. U.S. crude oil imports averaged about 7.5 million barrels per day last week, down by 396,000 barrels per day from the previous week. Over the last four weeks, crude oil imports averaged over 7.6 million barrels per day, 0.5% above the same four-week period last year. Total motor gasoline imports (including both finished gasoline and gasoline blending components) last week averaged 589,000 barrels per day. Distillate fuel imports averaged 130,000 barrels per day last week. U.S. commercial crude oil inventories (excluding those in the Strategic Petroleum Reserve) increased by 2.6 million barrels from the previous week. At 458.0 million barrels, U.S. crude oil inventories remain near levels not seen for this time of year in at least the last 80 years. Total motor gasoline inventories increased by 0.4 million barrels last week, but are in the middle of the average range. Finished gasoline inventories increased while blending components inventories decreased last week. Distillate fuel inventories increased by 1.0 million barrels last week but are in the middle of the average range for this time of year. Propane/propylene inventories rose 0.2 million barrels last week and are well above the upper limit of the average range. Total commercial petroleum inventories increased by 3.2 million barrels last week. Total products supplied over the last four-week period averaged over 20.2 million barrels per day, up by 4.2% from the same period last year. Over the last four weeks, motor gasoline product supplied averaged over 9.3 million barrels per day, up by 3.8% from the same period last year. Distillate fuel product supplied averaged 3.7 million barrels per day over the last four weeks, down by 1.2% from the same period last year. Jet fuel product supplied is up 7.5% compared to the same four-week period last year. U.S. oil production has grown rapidly in recent years. U.S. Energy Information Administration (EIA) data, which reflect combined production of crude oil and lease condensate, show a rise from 5.6 million barrels per day (bbl/d) in 2011 to 7.5 million bbl/d in 2013, and a record 1.2 million bbl/d increase to 8.7 million bbl/d in 2014. Increasing production of light crude oil in low-permeability or tight resource formations in regions like the Bakken, Permian Basin, and Eagle Ford (often referred to as light tight oil) account for nearly all the net growth in U.S. crude oil production. EIA’s latest Short-Term Energy Outlook, issued in May 2015, reflects continued production growth in 2015 and 2016, albeit at a slower pace than in 2013 and 2014, with U.S. crude oil production in 2016 forecast to reach 9.2 million bbl/d. Beyond 2016, the Annual Energy Outlook 2015 (AEO2015) projects further production growth, although its pace and duration remains highly uncertain. 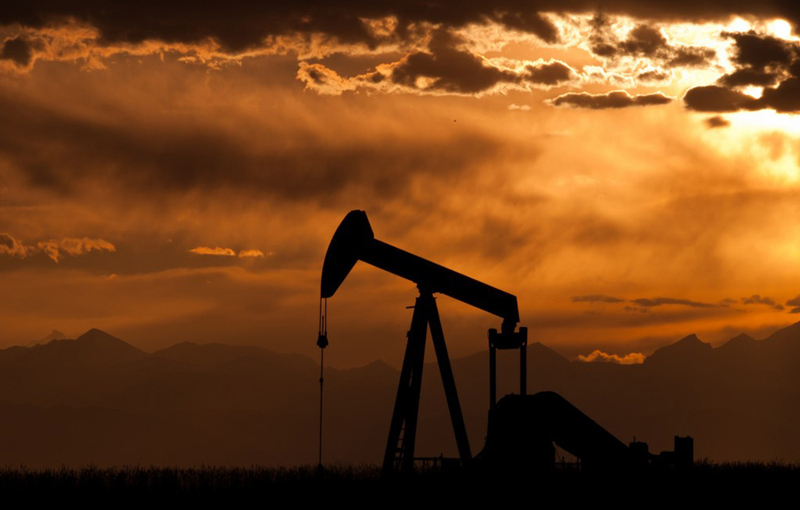 Recent increases in domestic crude oil production and the prospect of continued supply growth have sparked discussion on the topic of how rising crude volumes might be absorbed. As EIA noted nearly two years ago, relaxation of restrictions on U.S. exports of crude oil is only one among several ways to accommodate growing near-term flows of domestic production (EIA, This Week in Petroleum, “Absorbing increases in U.S. crude oil production,” May 1, 2013). Recognizing that some options, such as like-for-like replacement of import streams, are inherently limited, the question of how a relaxation in current limitations on crude exports might affect domestic and international markets for both crude oil and products continues to hold great interest for policymakers, industry, and the public. In response to multiple requests, EIA is developing analyses that shed light on this question, including earlier reports on gasoline price determinants (EIA, What drives gasoline prices?, October 2014), changes in U.S. crude oil imports to accommodate increased domestic production (This Week in Petroleum, “Crude oil imports continue to decline,” January 23, 2014), options for refinery capacity expansion (EIA, Technical Options for Processing Additional Light Tight Oil Volumes within the United States, March 2015), and refinery responses to higher, but fixed, levels of domestic crude oil production under both current crude oil export restrictions and with unrestricted crude oil exports (Implications of higher domestic crude oil production for U.S. refining, May 2015). This report updates and extends a May 2014 EIA report, U.S. crude oil production forecast – analysis of crude types. 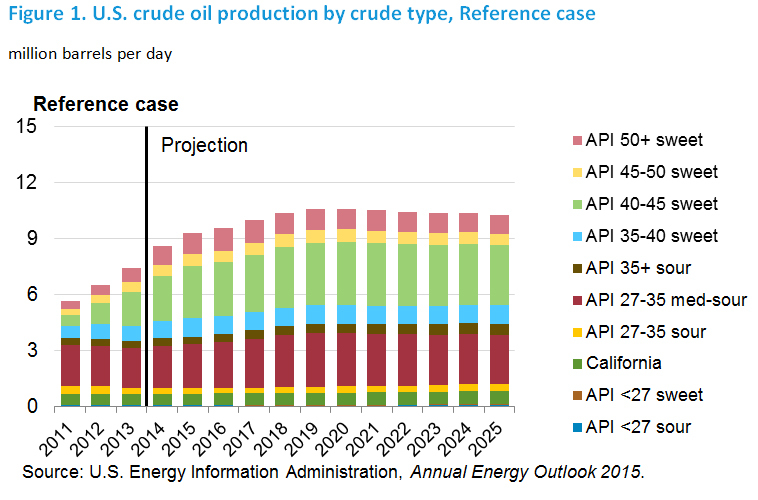 It provides a projection of domestic crude oil production by crude type through 2025, supplementing the overall production projection provided in the AEO2015. Projections of production by crude type matter for several reasons. First, U.S. crude streams vary widely in quality. Second, the economics surrounding various options for the domestic use of additional domestic oil production are directly dependent on crude quality characteristics. Third, actual or potential export values also vary significantly with quality characteristics. In conjunction with other reports issued by EIA over the past year, this report provides a foundation for further analysis of the market outlook and the effects of a possible relaxation of existing restrictions on U.S. crude oil exports.